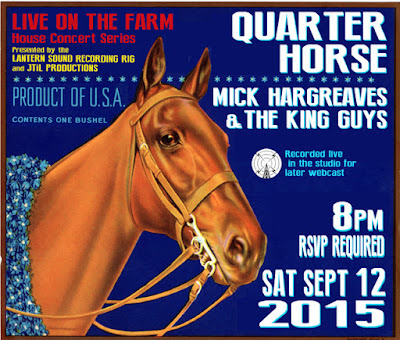 SAT SEPT 12 2015. Doors 8pm. Music 9pm. We are located in the Central Long Island Pine Barrens. RSVP to Mick via all the usual Social media suspects, or email (mick_hargreaves at yahoo dot com) to get details and location. 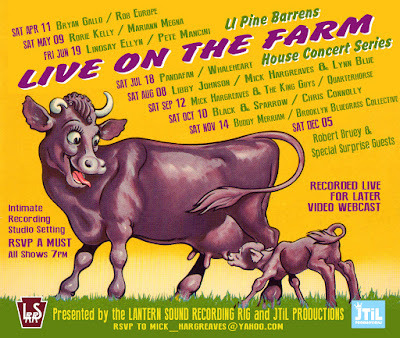 The sixth installment of our "Live on the Farm" house concert series, recorded live for video and audio, features Quarter Horse, an area americana band with rock, folk, alternative, country, blues, and jazz influence. They are known for three part vocal harmonies, tandem lead guitar, and improvisation. 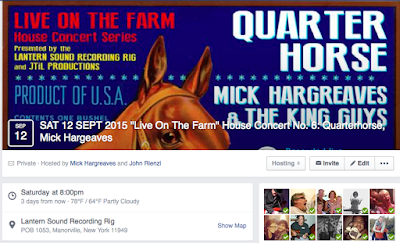 Mick Hargreaves, singer/songwriter, and proprietor of the Lantern Sound Recording Rig, will open the show, joined by Michael D. Bifulco on electric stylings, and they'll do selections from Mick's upcoming release. Beverages, snacks. $15 suggested donation goes to the artists. Bring a dish to pass, BYOB AOK. 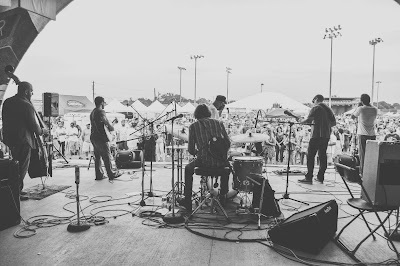 An americana band with rock, folk, alternative, country, blues, and jazz influence. They are known for three part vocal harmonies, tandem lead guitar, and improvisation. 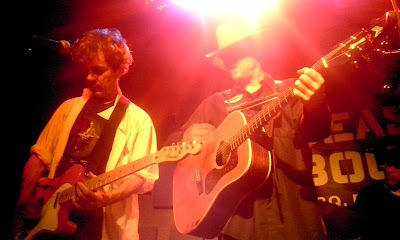 Mick acoustic and hollering, Mike electric guitars and such.